You may have noticed based on my recent post for Chocolate Quinoa Cake, that I've been on a bit of a chocolate kick lately. Have you tried it yet? It's been freezing cold here in Toronto, Canada and chocolate is definitely a comfort food for me, which is why I've been loving this granola. This Chocolate Chia Granola is perfect for a chilly morning or those days when you need an extra hit of energy! I mean, just look at all those superfoods! We spent the holidays with my in-laws down south in Florida, so I'm feeling even more like a wimp when being blasted in the face with cold air. However, I've been doing my best to still get outside and take Vienna for walks to get my nature vitamin. :) In fact, I'm just coming back from a nice walk in the park. It seems like the only way to get Vienna to sleep during the day is if we go for a walk, which reminds me, I really need to write a Vienna update, I'm behind in my monthly updates. Where is the time going?!! Back to the granola; I don't know about you, but I find good-quality store-bought granola very expensive. I prefer to make it myself, then I can control exactly what ingredients go into it. 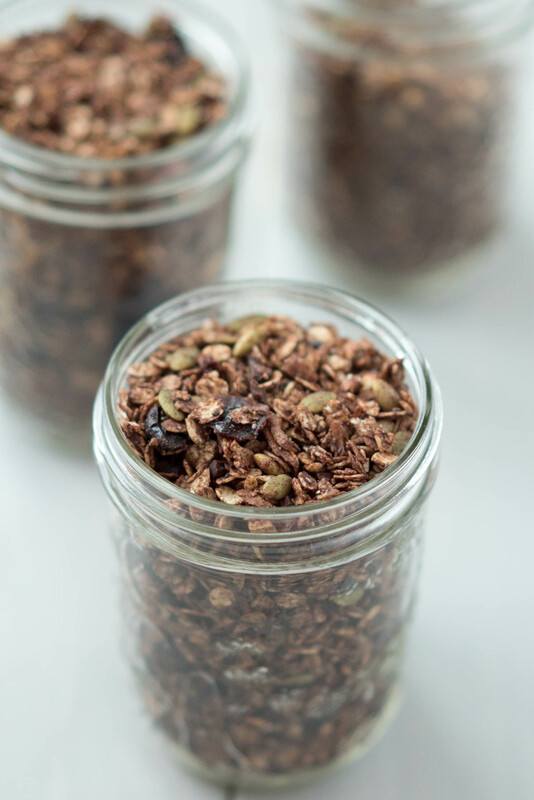 This granola is super-energizing and filling because of the raw cacao powder and nibs, plus the coconut oil. 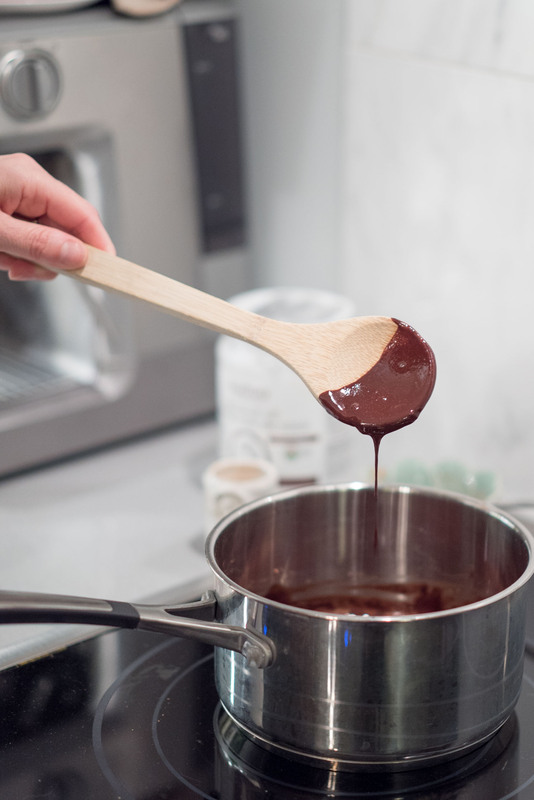 The chocolate syrup is very easy to make, and if you use raw cacao, you'll be getting a megawatt dose of anti-inflammatory and antioxidant nutrients. Just keep the temp on your stove super low so it doesn't burn. By the way, this is exactly how I make my chocolate bark in my book Joyous Health  raw cacao, coconut oil and maple syrup  using different measurements of course. I would suggest you give this syrup a little taste test. You may wish it to be a touch sweeter. I don't mind mine being super-duper bittersweet, which is why I only use 1/4 cup of dark maple syrup. Just listen to your taste buds! In a small pot on the stove, melt the coconut oil. Add the raw cacao powder and the maple syrup and stir until combined. Be careful not to burn the mixture, keep temperature on low. Once combined, remove from heat and set aside. 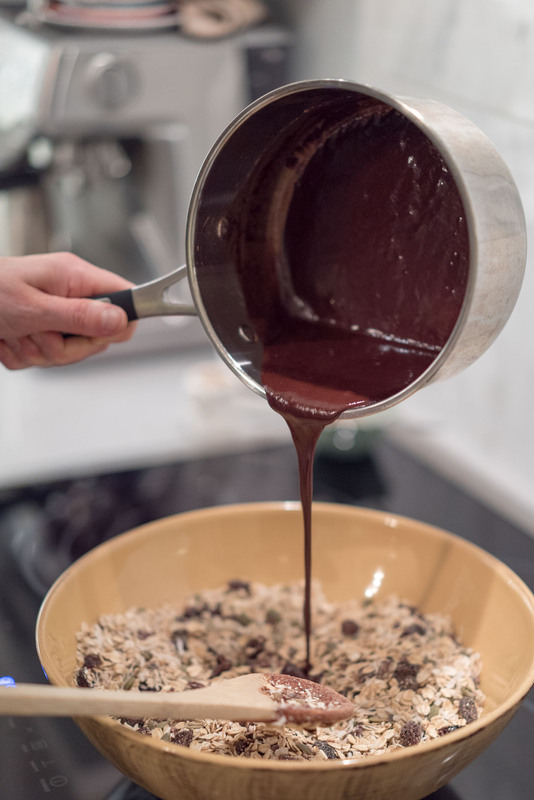 In a large mixing bowl, combine the oats, cranberries, coconut, pumpkin seeds, raw cacao nibs chia seeds and cinnamon. Next, pour chocolate syrup mixture over oat mixture and mix until fully combined. Give it a taste test. If you want it sweeter, you can add a touch more maple syrup. Grease a cookie sheet or cover with parchment paper. You'll need to divide the mixture between 2 cookie sheets because it won't fit all on to one. Bake for 10-15 minutes. Remove from oven, stir the granola so that it bakes evenly. Bake for 5-10 minutes more. 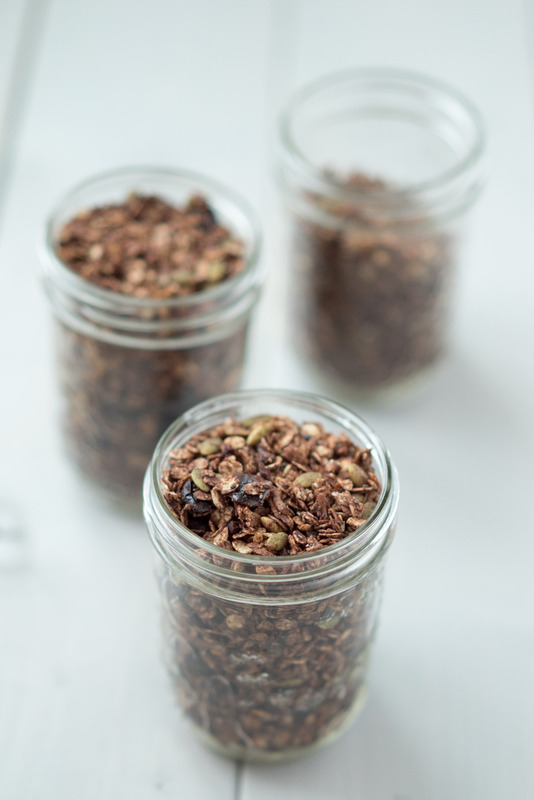 This makes enough granola to fill 3 small mason jars, approximately 4 1/2-5 cups of granola. Raw cacao powder and nibs can be purchased from a health food store or the natural foods section of your grocery store. Giddy Yoyo, Organic Traditions and Navitas Naturals are all great brands. If you can't or don't eat oats, you can use quinoa flakes instead. Spelt flakes are really nice too! This recipe makes three full mason jars, despite that jar in the back being half-full. I had breakfast before Walker took a shot of the jars of granola. I enjoyed it with some sheep's milk yogurt and frozen organic raspberries. Just look at all that chocolatiness!! It was SOOOOO yummy and it's really easy to make granola. Please do let me know what you think of this recipe! If you have any fun ideas of additional ingredients please post below. This is super delicious and as you say, much healthier and even more cost effective than store bought. I added a small handful of raw organic sunflower seeds and another crushed pecans. I cooked the second batch a little less than the first / it does burn easily I found :) yum! Made a 1/2 batch of this granola over the weekend an it turned out wonderful! Delicious topper for smoothie bowls, yogurt, of just a little sweet treat when a craving hits. Hello, I am allergic to oats (and rice)... what would you substitute? This recipe looks yummy! Hi there what would suggest instead of oatmeal. My daughter has quite a sensativity even to gf oats. also cashews and almonds.... thanks! Seriously, you found granola expensive? You, using so many, mostly expensive ingredients?? Looks good! What brand of dried cranberries do you recommend? Thanks! I love this granola - it is my go-to and I make it often! The first time I made it the dried cranberries got too hard when baked so I omit this ingredient and always add chopped nuts. That's a great idea Dana! You could always add the cranberries at the end and skip roasting them too. But your swap sounds delish!